Hello, Bonanzlers! Most of you are familiar with our Seller Spotlight Series, where we interview sellers and provide educational and inspirational details about their journey with Bonanza. You can submit your interest in being selected for a Seller Spotlight feature here. But did you know that you can also redeem tokens to receive a dedicated blog post about you and your booth? That's right - an entire blog post dedicated to learning about you and advertising a few of your favorite items! If you want to learn more about this reward or how else to spend your hard earned tokens, check out this list of token rewards. RustyRed's was founded in 2006, when Linda began selling items on eBay. Four years later, she was having a conversation with a friend about the TV show Bonanza. To settle their question, they searched for "Bonanza" on Google, and the rest was history. Linda's first impression of Bonanza? "I liked everything about Bonanza. It had such a friendly, family vibe, and it was fun meeting new selling friends who were eager to help me get started." When asked what advice she has for new sellers, Linda said "If I could tell a new seller anything, I would tell them to keep their prices competitive with eBay sellers. Stay on top of your bmails and respond to everyone who has a question about your booth." In her spare time, Linda loves giving compliments to strangers, watching reality tv shows, and anything related to aliens. If she could spend a day with anyone, it would be Nikola Tesla, one of the greatest scientists that ever lived. You probably recognize his name from the automobile company that's named after him, but "if you have never heard of him, it's because he was branded as a mad scientist after telling other scientists that his inventions were inspired by alien messages he received. Our world would be more advanced if Tesla would of the honors he deserved - Google his name and be amazed." Made with the finest simulated diamonds around. Lobster claw clasp. Pendant is 2.25" x 1.5" and chain is 16" with 2" extender. Channel your inner Wonder Woman side with this bold, red stone ring with a baby pink face! Handmade, Size 7. Very lightweight and a real beauty! 97% poly, 3% spandex, 54" from under the arm all the way around and 28" long. These loafers are believed to be leather. The widest part of the shoe is 4.5 inches. These shoes have never been worn. This is a beautiful, fun piece to have! It has a faux fur trim hood and is 24" in length and 40" from under the arm all the way around. For teens or adults. This Golden Girl Coach bag is a real beauty. 15" wide, 9" high, 6.5" deep, with an 8" handle drop. Large pocket on the outside, and pockets on the walls inside. Linda loves to use the Hand Picked Lists feature on Bonanza. "For quite a long time now, I have enjoyed running a Hand Picked List called "Trove of Treasures." I do a new version every week that's posted on Sunday or Monday. 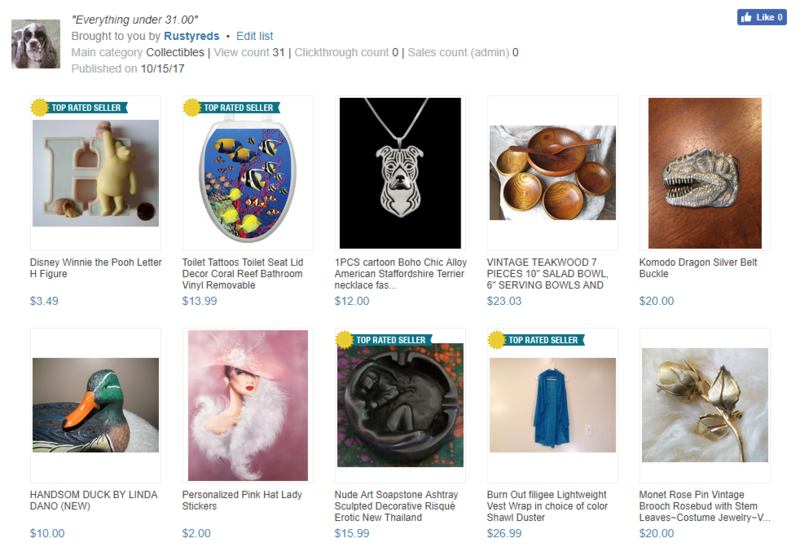 Some items are new and others have been on the list before, but all items are under $31.00. I feature lots of items from booths that have discounts. Quite a few people stop by to see what the picks are for each week, and some nice sales have been made through the list. "Remember friends, think deeply instead of clearly. One must be sane to think clearly, but one can think deeply and be insane. If you're ever in my area, stop by for some roadkill stew. Hope I gave you that first laugh for the day!"